185 min. Paramount Pictures. Directors: Anthony Mann, Yakima Canutt (II). Cast: Sophia Loren, Stephen Boyd, Alec Guinness, James Mason, Christopher Plummer. Ask anyone who knows about The Fall of the Roman Empire, and their response is sure to include the word "sumptuous." From back in the day when epic meant upwards of 10,000 extras, gargantuan sets, and 122-piece orchestras, Anthony Mann's 1964 consolation prize after being fired from 1960's Spartacus is filled with literal pageantry: parades of troops in authentic costumes and plenty of heraldic ceremony. It's unusual for a set to be a film's greatest achievement, but here is an unusual set, shepherded by the great Veniero Colasanti and John Moore, partners in production design, set decoration, and costume design. The Roman Forum was completely constructed: 27 structures over seven months, down to the cobblestones and statuary. In other words, CGI is for wimps. No backdrops, no matte paintings, no facades—this was a three-dimensional scale replica. 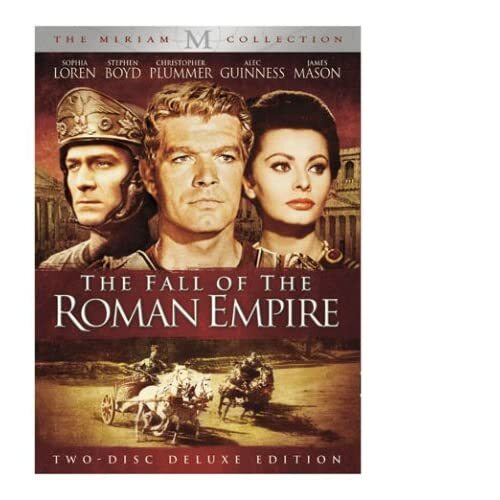 Aside from the jaw-dropping sets and costumes, The Fall of the Roman Empire is a pretty decent movie in its own right, sometimes overripe or stodgily stolid, but in its fictionalized way acknowledging the complicated political pressures that worked against the empire. Inspired by Edward Gibbon's The Decline and Fall of the Roman Empire, the screenplay by Ben Barzman, Basilio Franchina, and Philip Yordan dramatizes the chestnut "A great civilization is not conquered from without until it has been destroyed from within." Alec Guinness plays dying emperor Marcus Aurelius, who fretfully tries to put the empire in order before he expires. Wary of his arrogant and wanton son Commodus (Christopher Plummer), the philosopher-emperor privately names as his successor the fictional Livius (square-jawed leading man Stephen Boyd). For political reasons, Marcus Aurelius ruefully pledges his daughter Lucilla (Sophia Loren) to Sohamus (Omar Sharif), an Armenian prince. Trouble is she and Lucius are lovers, as proven by multiple overripe romantic exchanges that won neither actor any accolades. The old-school acting can inspire eye-rolling at times, but Guinness, Mason, and Plummer ("Let's not think; let's drink!") keep things lively with well-calibrated performances, and John Ireland, Mel Ferrer, and Anthony Quayle contribute as supporting players. Mann ably choreographs the action sequences, including an impressive chariot race sequence and battles between the Romans and the raven-maned Germanic "barbarians" at the gates. This long film's centerpiece scene is Commodus' quite remarkable procession into what may be the largest film set ever built—the Roman Forum recreation—culminating in the warning "Remember: thou art mortal." Tell that to producer Samuel Bronston, who bankrupted his production company with this entertaining epic. The Miriam Collection's outstanding two and three-disc DVD special editions offer a good widescreen transfer and great extras for this forty-four-year-old film. Though the transfer betrays some mild digital artifacting and a somewhat dulled color palette, the film looks pretty darn good for its age, and it's presented in its original Roadshow release version. Discs one and two include an in-depth feature commentary by Bill Bronston (son of producer Samuel Bronston) and Bronston biographer Mel Martin. Disc one also includes the full-color 1964 promotional film "Rome in Madrid" (22:18), narrated by James Mason. A cut above the usual puff piece (though clearly "puffy," make no mistake), the film gives us glimpses of the set being built, as well as the production's stables and arsenal; Loren's arrival in Madrid; costume and makeup screen tests for Guinness, Plummer, Boyd, Mason, and Sharif; Guinness and Plummer in a staged chess match; and a comparison of the standing Roman ruins, artist's rendering of the buildings, and the finished set. Disc one also houses the theatrical trailer (4:03), cast and crew filmographies, still galleries of behind-the-scenes shots and promotional material, and DVD previews for El Cid, Cinema Paradiso, and Control. Disc two rolls out a great new documentary on the film's making, "The Rise and Fall of an Epic Production" (29:12), featuring the comments of Bill Bronston, Martin, writer and Ben Barzman's wife Norma Barzman, director Mann's wife Anna and daughter Nina, production manager C.O. "Doc" Erickson, and authors Paul G. Nagle and Neal M. Rosendorf. "Hollywood vs. History" (9:45) finds the experts (Dr. Peter Heather of King's College London and Dr. Ronald Mellor of UCLA) comparing the film's script to what's historically known, and "The Rise and Fall of an Empire" (10:56) lays out more of the known facts, unencumbered by Hollywood. "Dimitri Tiomkin: Scoring the Roman Empire" (20:04) goes into magnificent depth on the subtleties of the composer's work on the film, as explained by film music historian Jon Burlingame, Tiomkin widow Olivia Tiomkin-Douglas, and conductor John Mauceri. Disc two also includes an "About the Film" screen that addresses the recent finding of deleted footage, noting its planned inclusion "on a future Miriam Collection release." 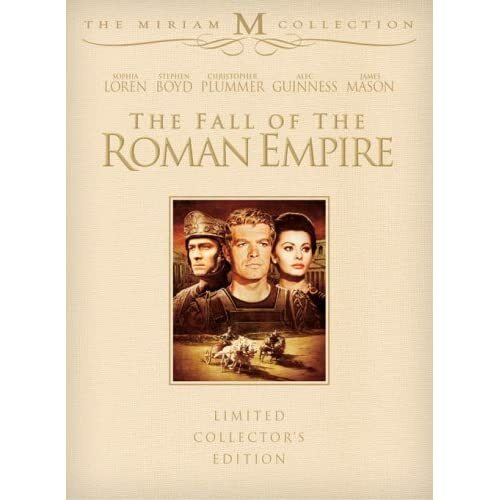 The three-disc edition comes packaged in a special box with 32-page reproduction of the original souvenir program, six postcard-sized "production still" reproductions, and a bonus third disc that includes Encyclopaedia Brittanica Educational Shorts About the Roman Empire (56:57 with "Play All" option). These provide a great opportunity to view the film's sets and costumes from different angles while learning a bit more about Roman life (and indulging nostalgia for classroom filmstrips). The segments are: "New Introduction" (3:30) with Bill Deneon, producer and editor of Encyclopaedia Brittanica films, in the present; "Original Introduction" (2:33), with Deneon "then"; "Life in Ancient Rome" (13:00); "Julius Caesar: The Rose of the Roman Empire" (21:42), and "Claudius: Boy of Ancient Rome" (16:10). With their cheese mitigated by the production value, the films are worth a look. All site content © 2000-2019 Peter Canavese. Page generated at 04/23/2019 03:23:46AM.